Jaymee Goh in her steampunk magistrate outfit. Image courtesy of Astra Kim. So, Nova Albion Steampunk Exhibition, ya’ll. I’m going to start at the beginning, which is way before the actual convention itself. You may not like what you read. In fact, ya’ll might accuse me of negativity. Fair ’nuff. 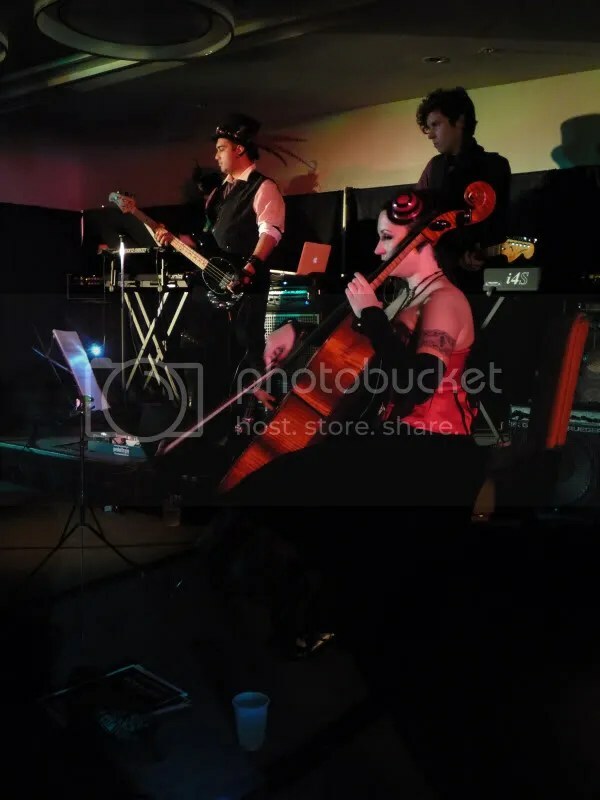 I’ll state upfront that Nova Albion is the second steampunk con I’ve attended, and the fourth fan convention. I’m not really big on conventions. I think costumes are expensive (fun! but expensive) and unless I feel like I’m actually contributing to something (my presence does not count) I don’t feel like it’s worthwhile subjecting myself to so many strangers. I am a misanthrope like that. Ay-Leen and I were invited to be guest speakers at Nova Albion, and we were quite flattered. Neither Dan nor Ariane struck me as anything other than white, and when a white-led group tackles a theme as this, I don’t trust them to handle it well. This would not have been my reaction years ago, before I was involved in anti-racist activism. Just something I have picked up from years of being involved with other PoC who have been failed by white-led groups and events, time and again. 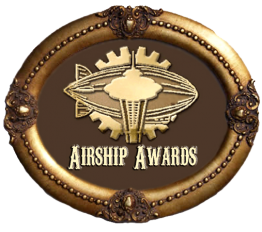 Considering my work is on how badly misrepresented and underrepresented Asians and other minorities in white-dominated spheres are in steampunk, my defenses went right up. But still, Nova Albion is in California! And I heard California is like, land of Asians in the realm of America! We both made suggestions that the organizers look up local organizations to speak at the convention, because, what an opportunity to highlight the local Asian populations! Bring in history that’s rarely discussed in mainstream spaces! Or just lend exposure to local Asians who might not have such a platform otherwise! I was looking forward to meeting some awesome Asian intellectuals and academics and, of course, fellow steampunks! The problems started early: the Guests of Honor were Cherie Priest, of the Clockwork Century books, and Paul Guinan and Anina Bennet of Boilerplate fame. I have nothing against these fine folks, and I think very highly of Cherie Priest in general, but neither of them have work that directly pertained to the theme — Wild Wild East. In the meantime, James Ng’s art was used to promote the convention. Ay-Leen and I were trying to scrape up money to afford to go. The implication that actual Asian folks of the steampunk scene had to fret to attend an Eastern-themed steampunk convention didn’t sit well with me. Fortunately, my university gave me some funding, so I could afford hotel for both Ay-Leen and myself. Why wasn’t James Ng immediately Guest of Honor of this convention? Perhaps because Cherie, Paul and Anina had been confirmed before the theme was set. Perhaps the organizers didn’t think they had the monies to bring James in from Hong Kong. Whatever the reason, it looked bad, and I was unimpressed, and a little insulted. This was a tiny papercut. Thirdly, the Wild Wild East, if one were to judge by the panel names, apparently consisted only of China and Japan. There were no panels on India, nor on Arabia, nor Africa. And speaking of The Wild Wild East Is Only China and Japan, Ay-Leen was slotted in to deliver a lecture on China in the 19th Century. Now, whilst Ay-Leen did cite “Asian Studies” as an interest, that’s not really a reason to immediately assume “China!” especially when she’s Vietnamese-American, and doesn’t even identify as Chinese. I was slotted onto the Sexual Politics and Suffragettes panel, which was a little awkward because it overlapped with another panel I was slated to be on, Steampunk as a Philosophical Arena. The overlap was less of a concern compared to: a) the fact that out of the four panellists, two were men, and b) “suffragettes” is a particularly UK/US term, which centers us right back in the West, rather than, you know, what the theme signified. Also, in place of talking about China, Ay-Leen offered to do the Social Issues in Steampunk Roundtable instead, which was what we wanted in the first place (except of course, the Social Issues roundtable clashed with my Philosophical Arena panel…). Two were changed. The other two remained the same. And instead of The Far East, it was, China and Japan. Oh, can’t win. Before I go on to squee and gush over the social niceties of actually being there, let me be frank: I was upset at all this. I expected to be the POC Educator, but the problems shouldn’t start until I arrived. I ranted and railed about this to Ay-Leen. I couldn’t pull out, because I was going to be Ay-Leen’s immoral supporter (hey, everybody’s gotta have one), and I’d already committed my university funding to this trip. So I vented to specific people and kept quiet in general and reserved my spoons. Traveling into the States, as a Malaysian passport holder, is generally bad enough. I steeled myself for the worst. The beginning of the convention was a bit of a blur for me; Ay-Leen and I wandered around looking for where registration was. And within the first hour, we met Astra Kim, local steampunk and photographer, Mo Awobo, proprietress of Opera Scura and her vendor minion Essandra. Mo immediately copped to her appropriation of chinoiserie to fit the theme. We also attempted stalking James Ng because we knew he’d checked in the night before too (well, I attempted stalking James Ng) but the nice lady at the desk wouldn’t give us his room number, so we settled for calling his room to get him down. I was pleased to finally meet James, after our first contact in October 2009. He’s also much hotter in real life. Just saying. 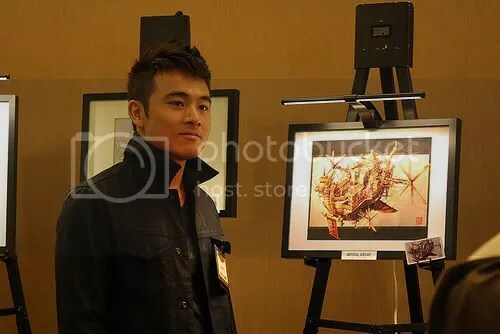 James Ng and his artwork. Image courtesy of Astra Kim. Nova Albion also brought me into face-to-face contact with the Airship Ambassador Kevin Steil as well. I flitted from panel to panel. Initially I sat in on the “What’s So Punk About Steampunk” panel but I got bored, so I went to check out the presentation on “Shanghai’s Golden Age” by Joshua Merrill. I was intrigued by this, and wanted to see how well it would be handled. He did all right—it wasn’t exactly a well-scripted talk, and he had the misfortune to not have a projector. Or maybe it was good fortune, because it meant everyone had to sit closer, and it was cosy as a result. One of the many pictures we took and sent to Mike Perschon via Twitter to lament his lack of attendance at Nova Albion. 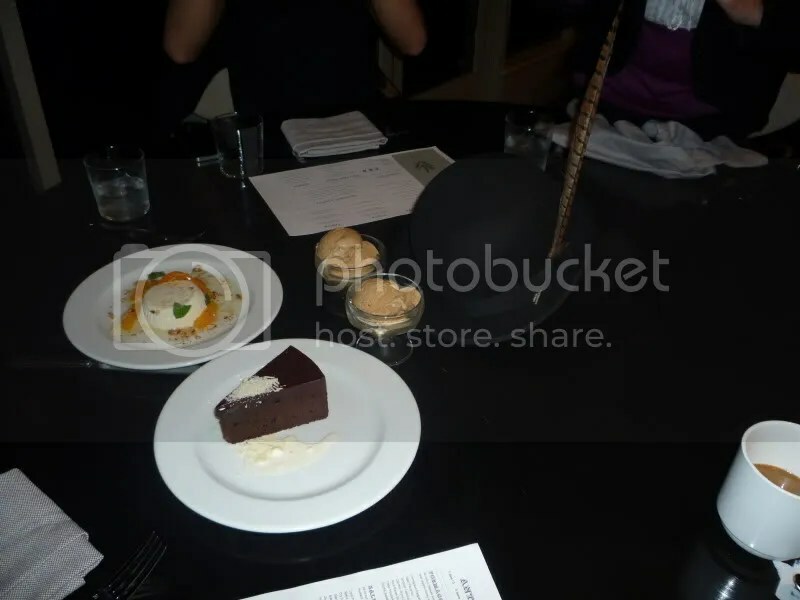 In this case, an array of desserts he obviously could not enjoy with us. 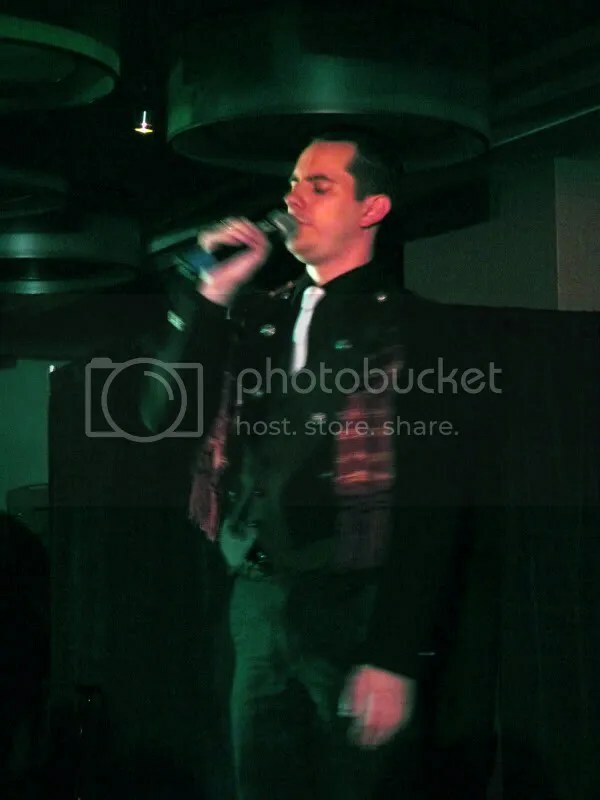 Image courtesy of Ay-leen. I napped, of course, and went back down at the end of the costume contest. There were, of course, the prerequisite Oriental costumes, those Lawrence of Arabia-esque robes, and historically-accurate costumes. Clearly a lot of love had been woven into those costumes. And not just a bit of thoughtlessness as to what it would signify. But I enjoyed watching people waltz (and will admit, I was envious of all these people with partners!) because, let’s face it, waltzes are awesome! Thus placed into a state of fuzzy well-being, I finally got to watch Vernian Process, live, and got my dance on. In general, I really enjoy Vernian Process’ music. The frontman kept the show together, and I spent a few minutes loudly objectifying him to Kevin (I’m a terrible human being like that). At the end of the show, I introduced myself to the hot frontman, only to discover, oop! He’s Josh Pfeiffer and although I’d exchanged emails and comments with before, I had never really known how he looked like. Well, then, that was a pleasant surprise. Lead singer Josh Pfeiffer of Vernian Process. Image courtesy of Ay-leen. Ay-Leen and I were waylaid by James Bacon, and we proceeded to have a long conversation about privilege and subject positions until the wee hours of the morning. Steam Around the World was slotted for the afternoon, so I spent a lot of time confirming that yes, we would have a projector, and yes, we would have a techie on site to help with any issues. I would like to extend a HUGE THANKS to staff member Laura, who wasn’t even in charge of this stuff, but who was really attentive, and made several calls to various people, and when there was no confirmation forthcoming, gave me her phone number so I could call to check in. Finally, an hour before the presentation, she finally managed to confirm that yes, there would be a projector. In between worrying about the projector, I popped in on the History of Tech panel, where Chris, Ay-Leen and Roget were in full swing. I must have entered late, but I thought Ay-Leen was rather quiet for the conversation. Roget was, as I mentioned above, quite fabulous, and I was super relieved to see another, not-necessarily-Asian steampunk of colour speaking! I also popped by Kaja Foglio’s table, and we talked about objectification in comics for a while. One of the reasons why I like Girl Genius is that there is about a good amount of male flesh for the female gaze, which is pretty rare in general, so I expressed this to Kaja, and she heartily agreed. She and her vendor minion, Alice Bently, also agreed to join the Steampunk Ladies’ Night Out with Liz Gorinsky. Steam Around the World went swimmingly: we began with our usual “Why Multicultural Steampunk?” and our cataloguing of various artistic approaches to subverting odds and ends. Before we began our third section on cultural appropriation, we had a brief interlude, where I asked the audience to remember the injustices of the past, which is why we have to have these conversations today. Ay-Leen pointed out the disquieting fact that, while white people were running around in their Orientalist costumes, and the convention attendees were predominantly white, the hotel staff were predominantly non-white. – I spoke to a lovely Latina lady about Brazilian steampunk, and how it’s out there but not getting enough exposure. – I spoke to a man named Ruben, of Yacqui descent, who asked a deeply troubling question, “how much license do minorities have in using their own culture for steampunk?” It made me realize just how tailored for a white audience our presentation was, and how, although this is an extremely important question, this is a conversation for a different crowd. – I also spoke to Joshua Merrill about his presentation the day before. Ay-Leen and I wandered around chatting to folks, and we had a good time hanging out with the St. Claire Aeronauts’ Aethernet Cable Station, sipping tea. I finished this day by meeting Krishna Raghunath, who interviewed Ay-Leen (and whose father also tagged along to help her, Krishna, your dad is awesome! ), and by some drinking. My first panel of the day was Steampunk as a Philosophical Arena, with Liz Gorinsky and Francesca Myman. I’m sure we didn’t actually talk about what was in the panel description. Instead, we talked about steampunk’s scavenging aesthetic and its potential problems with intellectual property. We also definitely touched on individualism and corporatism, and I pointed out numerous times how steampunk got a kickstart precisely because it is a commodifiable aesthetic. Liz and I talked about the difference between a viral aesthetic, and a defensive one, and she mentioned something about the mutated hierarchies present within steampunk as it is now. And of course I got onto my hobby horse to talk about race and white supremacy because I’m a jerk like that. At the Steampunk as Philosophy panel. Image courtesy of Astra Kim. The audience was quite fantastic. I really hate it when I hear overgeneralizing statements like “people don’t actually care about deeper issues” because these statements are, well, wrong. Sure, compared to the thousand-strong, twenty people are not a lot, but it’s enough to get a really wonderful conversation going. I’m sorry I didn’t take names, because I had a great time with you all. Even if I did freak out in the middle of the panel when someone asked me the dreaded question, “BUT WHERE IS THE LINE?” Sorry folks. – white young lady who asked me, outside the room, another version of the dreaded “where is the line?” question, but this time more on, “how do I show that I really love these cultures without disrespecting them?” to which I answered, “gotta question: why don’t you love your own culture?” She pretty much just paused for a fulsome moment. I don’t actually have a habit of asking white people this question, really, but the situation seemed to call for it. – White-passing Jewish dude who, whilst we discussed the Jewish identity and its relative erasure in modern steampunk, accompanied me to where Ay-Leen was hosting the Social Issues in Steampunk Roundtable. The Roundtable was intense. Emily Jiang was on fire talked about the Chinese Exclusion Act and Angel Island when I arrived, and she and Astra spoke about how the transmission of culture from immigrant parents to their children are often set aside in favour of survival. It was somber and again, conversations about deeper issues? Steampunks do love this stuff. A few of us reconvened downstairs after having to leave the room, including Juliette Capta, Astra Kim, Emily Jiang and William Fenton, continuing the conversation. 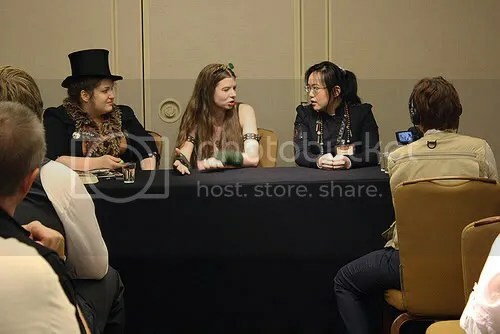 Sometime after this, I had to sit in a roundtable interview hosted by Ay-Leen, with Gail Carriger, Cherie Priest, Paul Guinan and Anina Bennet, talking about the Steampunk Bible that will be coming out in MAY SO KEEP YOUR EYES PEELED. I’m not sure why I was on it, but apparently I’m in the Bible, so I needed to talk about it. It was an excellent time. There was more convening later on, because Gail Carriger had some champagne to toast Mike Perschon’s birthday with, and more Twitter fun was had. For someone who wasn’t there, Mike sure had a presence! Sunday ended with a dinner out at Mountainview, courtesy of Emily Jiang, who also took me, Ay-Leen, Kevin and Kaja on a tour of the Google campus—oh, sorry, Googleplex. Then, after saying goodbye to Emily, Kaja, Kevin, Ay-Leen and I helped James pack his art up. Then there were drinks, and then there were goodbyes, and then I kissed James and gloated at Kevin. So, all in all, despite the shoddy handling of the theme, I did have fun. Would I go back to Nova Albion? Not unless I was being reimbursed. Would I avoid the West Coast entirely? Not at all! There were many fine folks there, and I think it’s great to be able to meet as wide a variety of people as possible. Conversations are always the same but different, and according to Ay-Leen, the steampunk scene appears very different on the West Coast than on the East Coast. I am disappointed to have missed meeting Shweta Narayan, whose Mughal Steampunk Empire stories appeared in Steampunk II and Steam-Powered. Some other time, then. I’ll be back on that side of the States in July, though, for the Portland GearCon! Maybe I’ll see some of you there. 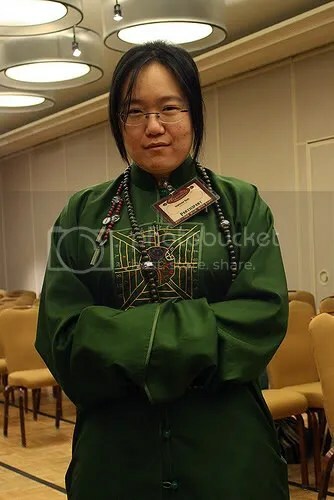 Jaymee Goh is a steampunk postcolonialist who blogs for Silver Goggles, among other places on the aetherwebs. It was great to finally meet you at Nova Albion. despite all of the technical difficulties with the sound, I still had fun. I’m sorry to hear about your troubles with the con. I’ll admit when I heard the theme of the con was Asians centric, I was a little worried, for precisely the same reasons as you. Hope to run into you when we tour back East sometime in the near future! Sorry that was supposed to say Asian-centric.